So you are coming to visit - a few fun tips and perhaps a few tricks.... Destin all the way to 30A is actually not very big - I say this because traffic can get crazy here. We depend on tourists and we love tourists so do not misunderstand, but to make your trip maybe a little smother (especially when you have kids) maybe a few of these things can help. When it rains it pours literally - our summers are hot and living on the gulf is amazing, we often get fun little spots of rain, they usually come up fast and leave fast, but be ready because when it happens everyone forgets how to drive including us. Expect traffic is what I am saying - our infrastructure does not allow for much relief in that department, so just know that about us. It seems like we are not in a hurry because we can't control what happens here during season. WIth that said - most people leave on Saturday morning and check in Saturday afternoon, so if you are leaving Saturday morning and you are going over the bridge it may take you awhile so I would suggest leave early or go to lunch and leave late - check out is usually around 10:00 am. When you are coming to Destin most everyone comes in Saturday evening so if you are trying to get here early again - so is everyone else and you can get stuck on the bridges for over an hour - come early or come later, just my 2 cents. Jelly fish! We have them some sting some do not - I love swim shirts when we have a lot of jelly fish and pay attention to our flags purple flags usually mean we have jellyfish. In the 16 years I have lived here I have never been stung, because our water is so clear you can actually see them. We have a lot of different jelly fish and we always carry jelly fish squish in our bag in case someone does get stung (you can get that anywhere - target, walgreens) the blue jelly fish are the Portugese Man-o-war and they are the ones that sting. Don't touch them even on the beach, they can look dead and still sting you. They have long tentacles and they are the ones to avoid, The pink jelly fish also avoid they are called 'meanie" for a reason. The clear ones are what I usually see and they are usually harmless. I know this is very general and they are usually no big deal, but watch the flags they are there for a reason. We also have stingrays which are really really cool, and I have never had an issue. Do the stingray shuffle and you will be fine. Stingrays like to bury themselves just below the sand and hide if you shuffle or slide your feet along the bottom the vibrations scare them away and you won't accidentally step on them. They do have a barbed tail and it will hurt f you get stung, so just a little advice. 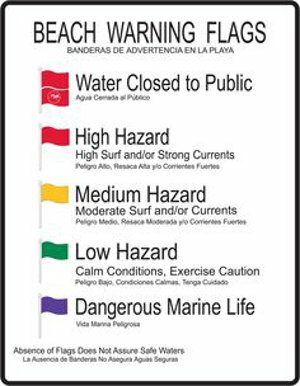 The best advice I can give to you is watch the flags - watch the flags - watch the flags - our biggest problem here is that we have a strong rip current sometimes and the flags will warn you, but no matter how great of a swimmer you are, you are no match for a rip tide. If you get caught in a rip current, try not to panic and do not swim into it. Swim parallel to the shore with the current it won't last long and then once you are out, swim to shore. Our sugar sand!!! Our sand is so white and so fine your feet will actually squeak when you walk in it. Interestingly enough, this process began thousands of years ago when tiny quartz particles from the Appalachian Mountains came down to our coast through the Apalachicola River. Our sand grains are actually almost perfect ovals, which is why it squeaks and it also why our water is so clear. This process is still occurring here and it is one of the very reason our beaches are the most beautiful beaches in the world. So a little history lesson, but if you have been here you know that not only is it beautiful it is sticky - sticks to everything, so a little locals hack - we use baby powder to get it off. Walk to your car and you should be dry by then and a little baby powder (or cornstarch) on your feet and hands gets it right off. Your Phone put it in a ziplock bag! It will still work and it won't be a disaster! SEAGULLS I love all of our birds, we all do and we have a lot of them, but don't feed the seagulls - I get it, they like to eat, they like cheetos, doritos, they will actually pretty much eat anything and usually right out of your hand. If you so choose to feed them, be forewarned, you have a really really great chance of attracting a whole group of them, like a bad move and they are not shy, they won't just go away and more importantly, they will probably poop on you (this is how locals KNOW you are on vacation, well, that and a sunburn). Be safe, we love our beaches we want you here and we want you to see how beautiful they are too.